Great languages are those that offer orthogonality in design. Stated simply it means that the language core offers a minimal set of non-overlapping ways to compose abstractions. In an earlier article A Case for Orthogonality in Design I discussed some features from languages like Haskell, C++ and Scala that help you compose higher order abstractions from smaller ones using techniques offered by those languages. In this post I discuss the new feature in Clojure that just made its way in the recently released 1.2. I am not going into what Protocols are - there are quite a few nice articles that introduce Clojure Protocols and the associated defrecord and deftype forms. This post will be some random rants about how protocols encourage non intrusive extension of abstractions without muddling inheritance into polymorphism. I also discuss some of my realizations about what protocols aren't, which I felt was equally important along with understanding what they are. Let's start with the familiar Show type class of Haskell ..
Takes a type and renders a string for it. You get show for your class if you have implemented it as an instance of the Show type class. The Show type class extends your abstraction transparently through an additional behavior set. We can do the same thing using protocols in Clojure .. The protocol definition just declares the contract without any concrete implementation in it. Under the covers it generates a Java interface which you can use in your Java code as well. But a protocol is not an interface. I can extend an existing type with the behaviors of this protocol. And for this I need not have the source code for the type. This is one of the benefits that ad hoc polymorphism of type classes offers - type classes (and Clojure protocols) are open. Note how this is in contrast to the compile time coupling of Java interface and inheritance. Extending java.lang.Integer with SHOW ..
We can extend an interface also. And get access to the added behavior from *any* of its implementations .. Here's extending clojure.lang.IPersistentVector ..
> "[12 1 4 15 2 4 67]"
And of course I can extend my own abstractions with the new behavior ..
(name-desc (Name. "ghosh" "debasish")) ;; "ghosh debasish"
(show (Name. "ghosh" "debasish")) ;; "ghosh debasish"
Protocols help you wire abstractions that are in no way related to each other. And it does this non-invasively. An object conforms to a protocol only if it implements the contract. As I mentioned before, there's no notion of hierarchy or inheritance related to this form of polymorphism. And there's no object bloat going on here. You can invoke show on any abstraction for which you implement the protocol, but show is never added as a method on that object. As an example try the following after implementing SHOW for Integer ..
will return an empty list. Hence there is no scope of *accidentally* overriding some one else's monkey patch on some shared class. Clojure protocols dispatch on the first argument of the methods. This limits its ability from getting the full power that Haskell / Scala type classes offer. Consider the counterpart of Show in Haskell, which is the Read type class .. If your abstraction implements Read, then the exact instance of the method invoked will depend on the return type. e.g. > [1,2,3] ++ read "[4,5,6]"
The specific instance of read that returns a list of integers is automatically invoked here. Haskell maintains the dispatch match as part of its global dictionary. We cannot do this in Clojure protocols, since it's unable to dispatch based on the return type. Protocols dispatch only on the first argument of the function. I have completed writing DSLs In Action. As we speak, the book has moved from the development editor to the copy editor. I will be starting the process of copy editing along with the team of helpful copy editors of Manning. The Table of Contents has been finalized. Have a look at the details and send me your feedbacks regarding the contents of the book. 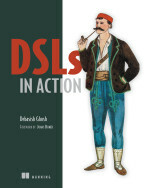 DSLs In Action is a book for the practitioner. It contains real world experience of writing DSLs in a multitude of JVM languages. As the table of contents show, I have used Java, Groovy, Ruby, Scala and Clojure to demonstrate their power in DSL design and implementation. I have also focused on the integration aspects between these languages, which is fashionably known today by the name of polyglot programming. All examples in the book are from the real world domain of securities trading and brokerage systems. I have intentionally chosen a specific domain to demonstrate the progression of DSL implementation from small trivial examples to serious complex and non-trivial ones. This also goes to bust a common myth that DSLs are applicable only for toy examples. Another recurring theme throughout the book has been a strong focus on abstraction design. Designing good DSLs in an exercise in making well-designed abstractions. A DSL is really a thin linguistic abstraction on top of the semantic model of the domain. If the underlying model is expressive enough and publishes well behaved abstractions, then designing a user friendly syntax on top of it becomes easy. The book discusses lots of tools and techniques that will help you think in terms of designing expressive DSLs. The book is replete with code written in multiple languages. You can get it all by cloning my github repo which contains maven based instructions to try most of them yourself. And finally, thanks to all the reviewers for the great feedback received so far. They have contributed a lot towards improvement of the book, all remaining mistakes are mine.